Abstract: The Russian Platform (RP) is one of the key-regions for the correlation of the Boreal and Tethyan stratigraphic successions. Zoogeographical analysis of ammonite distribution in the RP and adjacent areas demonstrates the existence of relations between different basins and the opening/closure of sublatitudinal and submeridional sea-connections in the RP area. Two epochs in the development of the RP were recognised. The Berriasian-Barremian time shows a close relation of the RP Basin to the Boreal Realm. During Aptian - Albian times the region was affected mainly by the Tethys Ocean. It is supposed that the Upper Volgian corresponds to the Lower Berriasian. The similarity of the Western Siberia and the Peri-Caspian - Mangyshlak fauna allows us to propose for the first time an existence of a direct connection between those basins. Berriasian-Valanginian sea-connections of the RP Basin are discussed in this paper. Abstract: The Albian to Turonian deposits in the Polish part of the Pieniny Klippen Belt comprise pelagic and shaly turbidite facies. They represent shallow (shelf) to deep-water environments, and they are relatively rich in radiolarian fauna. Over 70 radiolarian species of the Carpathian Tethyan low latitude realm were identified in over 200 samples from 18 sections in the deposits of the Pieniny, Branisko, Niedzica and Czorsztyn successions of the Pieniny Klippen Belt. 17 horizons containing abundant and well-preserved radiolarian fauna have been chosen for analysis. These data were processed with the BioGraph 2.02 computer program (Savary & Guex 1991) based on the Unitary Associations method. The program produced a sequence of 11 U.A. which were used for constructing the radiolarian zonal scheme. Three radiolarian zones and five subzones (Holocryptocanium barbui Zone with Stichomitra tosaensis, Squinabollum fossile, Thanarla pulchra, Torculum dengoi and Obeliscoites maximus subzones, Hemicryptocapsa prepolyhedra Zone and Hemicryptocapsa polyhedra Zone) have been proposed for the interval investigated. Abstract: Late Maastrichtian to Paleocene distal flysch sediments of the Raca Unit (Outer Flysch Carpathians) at the Uzgrun section provided a relatively rich fossil record (foraminifers, radiolarians, calcareous nannofossils). The Upper Maastrichtian can be subdivided into three calcareous nannofossil zones and the Paleocene assigned to one agglutinated foraminiferal zone. Some prospective new marker species of agglutinated foraminifers for subdivision of the Maastrichtian-Paleocene are discussed. The well preserved (pyritized) radiolarian fauna has brought interesting data on the radiolarian biostratigraphy. The integrated microbiostratigraphy approach enabled us to find the Cretaceous/Tertiary transition in a continuous flysch sequence of one partial outcrop. The transition is characterized by an increase in the frequency of coarser turbidite intervals and disappearance of calcareous sediments. The nannofossils show the influence of both Boreal and Tethyan bioprovince on the Magura depositional area. Abstract: Rhythmically bedded marls and limestones were studied in the Cenomanian deposits of SW part of Mountain Crimea in Ukraine. 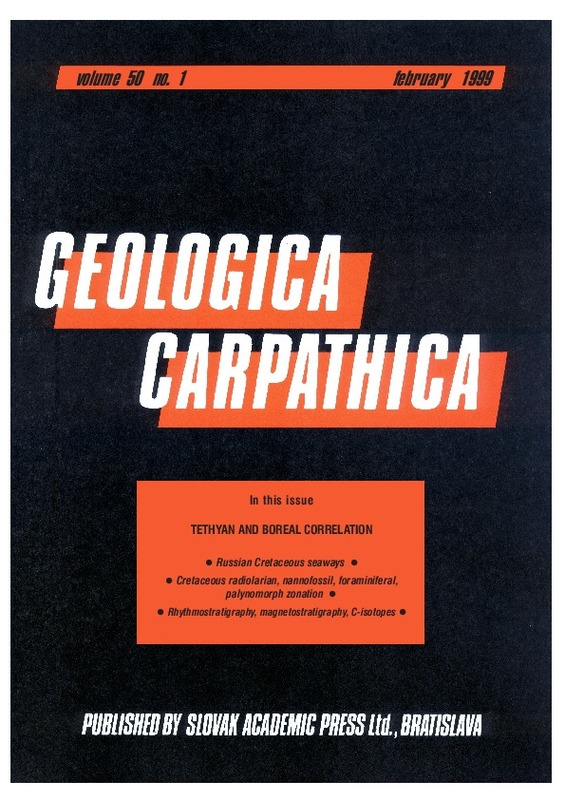 Carbonate content, TOC, XRD, foraminiferal, petromagnetic analyses and ichnofossil distribution analysis were carried out on 115 samples from 6 sections to define the nature of 5 types of rhythmicity. Marl-sandy marl rhythms of the Lower Cenomanian transform into limestone-marl rhythms of the Middle Cenomanian. Upper Cenomanian rocks contain limestone-limestone, limestone-marl rhythms and rhythmically bedded black shales (analog of „Bonarelli level“). The types of the rhythms can be classified due to lithology and their paleogeographic position. Cycles of dilution, solution and bioproduction are involved, 11 paleogeographic models are discussed, 6 are proposed. The nature of the rhythms can be connected with Milankovich cycles. Abstract: The foraminiferal and nannoplankton assemblages analysed in the Weglówka Marls, Subsilesian Unit, indicate the Campanian-Maastrichtian age. These sediments were deposited on the outer shelf and the upper-mid part of the slope. Palaeoecological analyses indicated a relationship between some morphotypes and their life strategies. Morphogroup analysis of the foraminiferids are indicative of palaeobathymetrical changes in the studied part of the basin, based on the relationship between keeled/non keeled taxa as well as on the quantitative distribution of the several benthic genera. The foraminiferids and the calcareous nannoplankton assemblages indicate the Tethyan/Boreal affinity. Abstract: Lower Cretaceous deposits of the Spas Shale from the Skole Nappe in Poland have been palynologically studied in several localities. Special emphasis has been put on the dinocyst assemblages. The Spas Shale consists of black shales which are intercalated with green shales in the uppermost part. All the samples yielded rich and well preserved dinocyst and other palynomorph assemblages. The age of the studied deposits, based on dinocysts, spans from middle-late Barremian to latest Albian (Vraconian). Palynofacies assemblages of the middle-upper Barremian samples are characteristic for the neritic paleoenvironment. That contradicts previous data based on foraminiferal and lithological researches and may suggest transport of shallow marine organic matter into the deeper part of the basin. The Albian palynofacies is characteristic for an open marine paleoenvironment influenced by land-derived material. The studied dinocysts are almost entirely warm-water taxa. The presence of a few cold-water species in the Barremian samples suggests a connection between the Tethyan and Boreal provinces. Abstract: Detailed carbon isotope stratigraphy was calibrated with standard ammonite stratigraphy for two Valanginian to Lower Hauterivian sections in Southern France, La Charce in the Vocontian basin and Pont de Carajuan on the Provence platform margin. The excellent correspondence of ammonite zonation and carbon isotope composition between the two sections allowed us to create a composite C-isotope curve. The Valanginian carbon isotope excursion starts with a positive δ13C-shift of ca. +1.3 ‰ in the upper Campylotoxus Zone. δ13C-values culminate in the Verrucosum Zone and decrease from the upper Verrucosum Zone to the Hauterivian Loryi Zone where they reach pre-excursion values again. Correlation of the Valanginian to Lower Hauterivian standard ammonite zonation of Southern France (N. Tethys) with other bio- and chronostratigraphies, such as the South Alpine nannofossil- and magnetostratigraphy (S. Tethys) is significantly improved by the link via carbon isotope stratigraphy.